Boat Description The compact, easy-handling Panfish 16 with stick steering is designed for anglers who love the year-round sport of panfishing. Fishing position is low to the water, so anglers can sit all day and still stay close to the action. 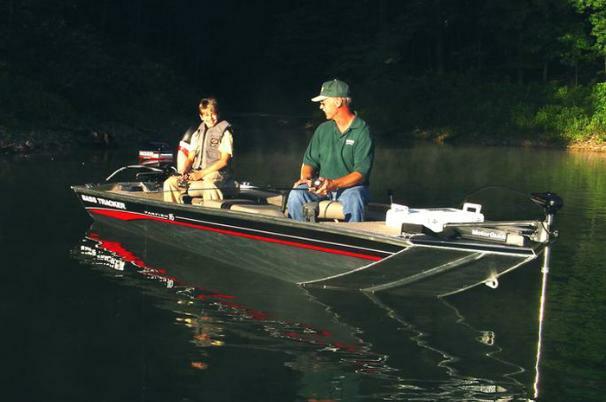 The all-welded Mod V hull with wide 72` beam makes for great fishing stability. Light-touch stick steering inches into tight weedy quarters or out into open waters, depending on the season and where the fish are biting. Package includes a Mercury Pro Series outboard, Lowrance X37 fish finder, MotorGuide foot-controlled trolling motor, aerated livewell and an easy-to-tow custom trailer with EZ lube hubs and GalvaShield protection. Dry Weight 715 lb approx.